"Fun, affordable, family entertainment that helps create memories. That's what we and every Minor League baseball team work to provide fans every night," stated Gabe Sinicropi, the Williamsport Crosscutters Vice President of Marketing and Public Relations. 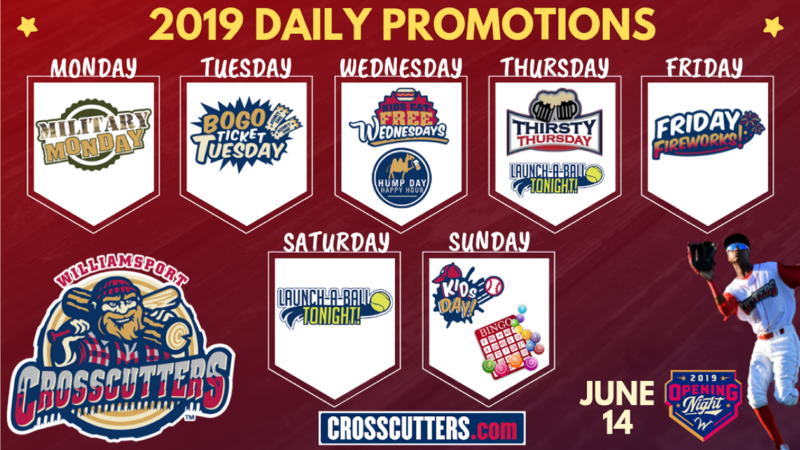 "Our Day of the Week Promotions serve as the foundation of our promotional schedule, providing events and savings fans can count on week after week throughout the season." Military Mondays - Fans showing proof of military service at the box office receive a free Stadium Reserved ticket courtesy of American Legion Post 104 of Montoursville, Master Sgt. Sean Thomas Foundation and Panda Patriot. BOGO Ticket Tuesdays presented by Giant - Receive buy one, get one free stadium reserved tickets when showing your Giant Bonus Card at the box office. Two-for-Tuesdays - All soft drinks are 2 for the price of 1 from open until close. Charitable Tuesdays presented by Woodlands Bank- Every Tuesday we spotlight a local charity doing great work in our community who also receives a cash donation from Woodlands Bank and the Crosscutters. Kids Eat Free- The first 100 kids age 12 and under get a free hot dog, chips and soft drink. Hump Day Happy Hour- $2 domestic pints and $1 off all craft beer pints until 7pm. Thirsty Thursday- $2 domestic pints and $1 off all craft beer pints from open until close. MedReturn Drug Take Back presented by the Lycoming County District Attorney's Office- Get a free hot dog and soft drink when you bring your unwanted or expired household medication, including prescriptions, over-the-counter drugs and unused pharmaceuticals for safe disposal. Launch-a-Ball- Fans have the opportunity to throw tennis balls at targets on the field after the game for a chance to win prizes including Shop Vacs, gift certificates to local businesses and more. Friday Fireworks- Every Friday home game features a post-game fireworks show with a special musical theme. Kids Day presented by WBRE & WYOU-TV- All kids age 12 and under get $1 stadium reserved tickets at the box office. Kids Run the Bases presented by Commonwealth Connections Academy- All kids age 12 and under come on the field to run the bases after the game with Boomer. Sundae Sunday- Make your own ice cream sundae for just $5. Jr. Jacks Kids Club presented by Hoss's Steak & Sea House- It's FREE to join for kids age 12 and under. Members receive FREE stadium reserved tickets to any Monday-Thursday games during the 2019 season!